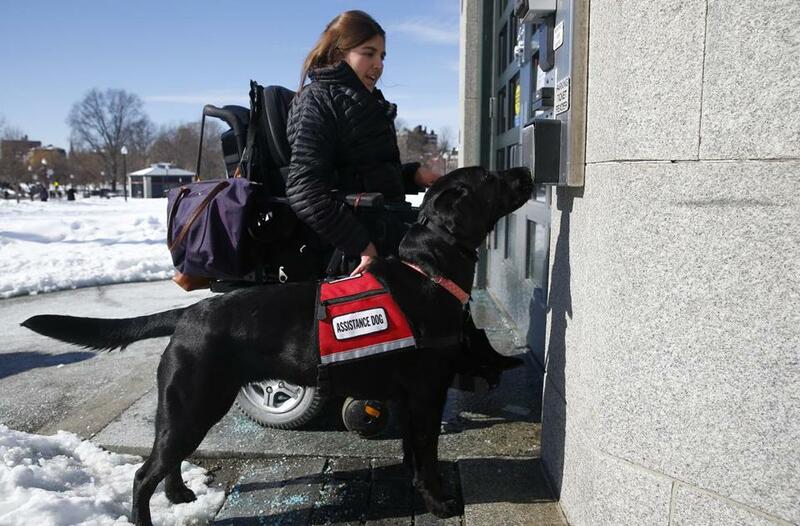 Carolyn Barrett’s service dog, Shadow, presses the button to open an automated door. She says bogus service dogs make her dog less accepted. It’s become a sneaky way to bring house pets into stores, restaurants, airplanes, and other places where four-legged creatures are usually banned: buy a service animal vest and — voila! — take Fido with you as you’re shopping, eating out, or catching a flight. Pretending your dog is a service animal is a harmless ruse, right? Wrong, disability advocates say. And in Massachusetts it could soon be against the law. To crack down on the growing problem of fake service dogs, state legislators are considering a bill that would make it a civil offense to misrepresent a pet as a service animal. For the unscrupulous, it’s a startlingly easy scheme: buy a no-questions-asked service dog vest, cape, “official certificate,” or “instant ID” online for as little as 99 cents. You can even “register” your dog for free. Problem is, there is no official service dog registry, and service animals are not required to have special equipment, documentation, or even formal training. The bill is also aimed at exposing bogus operations that sell untrained or poorly trained dogs to the disabled, especially veterans, potentially putting them at risk. Well-trained service dogs can press elevator buttons, retrieve dropped items, alert hearing-impaired people to doorbells and smoke alarms, provide balance to those with prosthetic limbs, sniff out life-threatening allergens, and sense when a person is having a medical emergency. For veterans with PTSD, they can prevent strangers from crowding too close. When phony service animals behave badly, they can make businesses skeptical of future customers claiming to have one. If ill-trained animals are aggressive, they can endanger their disabled owners. “What’s happening is you get somebody who thinks it’s cute to slap a vest on Fluffy and take Fluffy to CVS. What’s the harm?” said Lowry Heussler, 55, of Cambridge, who uses a service dog to help her walk due to a congenital hip problem. “The problem is that all the work we did of convincing the public that if you see a dog wearing a cape, that dog is safe and reliable and you don’t have to worry about anything — that work is being undone,” she said. 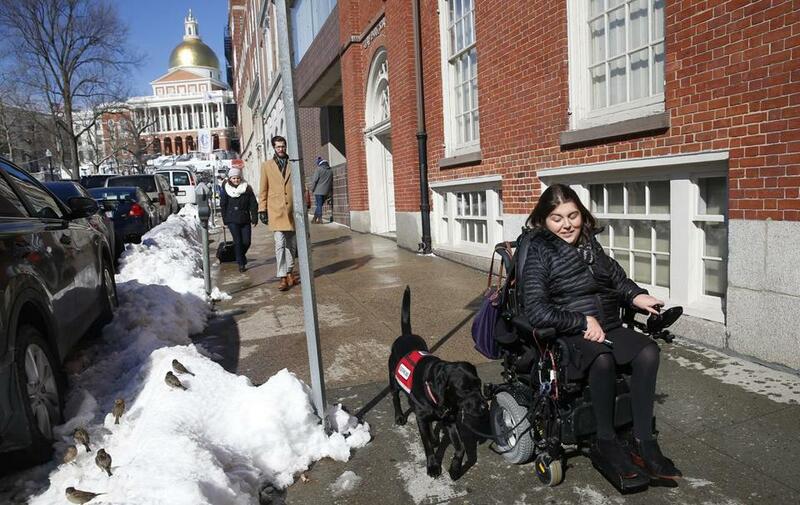 Modeled after similar laws in Florida and Colorado, the bill filed in Massachusetts targets people who use fake service dogs to obtain privileges meant for the disabled, such as the right to take a dog into an airplane passenger cabin without paying a fee. If it becomes law, fakers could be fined up to $500 and required to do 30 hours of community service. The Americans with Disabilities Act defines a service animal as one “individually trained to do work or perform tasks for the benefit of an individual with a disability.” That applies only to dogs and miniature horses, and excludes animals needed mainly for psychological support, such as so-called emotional support dogs, comfort dogs, and therapy dogs. An organization called Assistance Dogs International has developed minimum standards for the service dog industry, but the absence of an official national registry or official certification process means anyone can self-train a pet and call it a service animal. In a further complication, the US Department of Transportation allows emotional support animals on planes, although it is reconsidering its policy due to abuse, such as people reportedly bringing turkeys, pigs, and monkeys into passenger cabins. The Massachusetts bill would not apply to animals offering only psychological support. The ADA permits businesses to ask only two questions of someone claiming to have a service dog: Is the animal required because of a disability, and what work or tasks has the animal been trained to perform? But they can’t ask what the person’s disability is or ask the dog to demonstrate its skills. Shadow, Carolyn Barrett’s service dog, helps guide her down to Boston Common. Barrett says there are dogs that are clearly not well-trained walking around with service dog IDs. Framingham-based TJX Cos. declined to comment about the negative press it suffered in 2014 when a Boston Marathon bombing victim entered a T.J. Maxx with a dog wearing a service animal vest and was asked to put it in a shopping cart or leave the store. A diner in Oxford, Big I’s, faced a public backlash when its owner questioned a veteran’s claim that his Jack Russell terrier was a service dog, resulting in a call to boycott the business. The group wasn’t ejected, but the town manager later issued a memo to all department heads clarifying ADA rules about service dogs. Suspect “service animals” can be found on Craigslist for as little as $65, even though NEADS estimates it costs $42,000 to properly train a service animal.